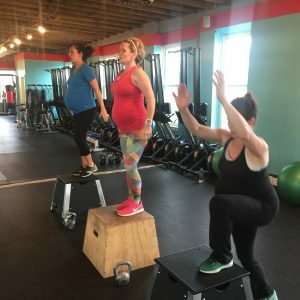 Medical experts agree that pregnant women who are free from any obstetric and medical problems should participate in 30 minutes of moderate intensity exercise on most, if not all, days of the week. Even if you have not exercised prior to becoming pregnant, you can still receive benefits throughout your pregnancy. 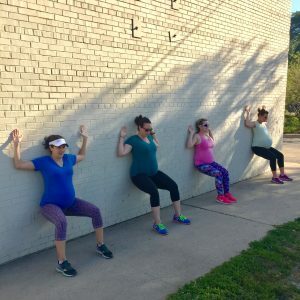 So to help you learn why prenatal exercise is so important for mom AND baby, we’ve compiled the top 10 benefits of exercise, and will help you get started with a regular exercise routine. If you are experiencing a healthy pregnancy and are new to exercise, start with walking but take it outdoors and make it brisk to get the most benefit. The fresh air will boost your mood, and increasing your heart rate will release endorphins – your body’s natural mood enhancer. Start walking 30 minutes a day for a few days per week and gradually increase your frequency to five to six days per week. Duration can be added if you are feeling good and have the time. If you are a veteran to exercise, the most important questions to answer are: What is your current fitness level? What exercises have you been doing regularly? In 2002 The American College of Obstetricians and Gynecologists (ACOG) stated that there is “no data to indicate that pregnant women should limit exercise intensity and lower target heart rate (THR) because of potential adverse effects”. You can maintain your fitness level if your doctor approves activity and your feel okay doing it. How Hard Should I Workout? Exercise intensity should not exceed pre-pregnancy levels. 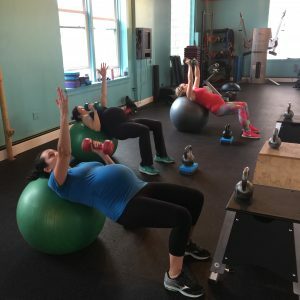 Aim to maintain pre-pregnancy fitness levels, in terms of strength, aerobic fitness, flexibility, as well as core muscle and pelvic floor integrity. Some exercises will need to be modified to adjust to physical changes. ACOG guidelines recommend avoiding exercise to “point of exhaustion”. Moderate Intensity Exercise – What does that mean? Use a 1 to 10 Scale of the Rate of Perceived Exertion (RPE), and intensity levels during pregnancy should be between 5-8. The “talk test” is another easy measure to keep exercise at a moderate level. You should always be able to talk while exercising – if you can’t talk, slow down and reduce intensity. The intensity of effort should be judged solely by how you feel and how your body responds during exercise. The reason why moderating intensity is important is to avoid over-heating and disrupting the uterus’s environment. Always drink plenty of fluids during and after exercising. Give yourself and your baby every advantage of prenatal exercise. Let AMC help you navigate the do’s & don’ts of prenatal exercise – no previous exercise experience is required. 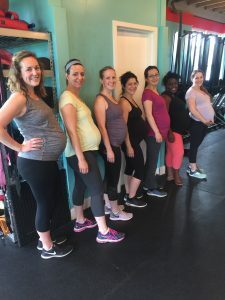 Our Small Group Prenatal Fitness program is more than a class – it is personalized training in a small group setting. Come take a test drive for just $25 to see what we’re all about. Visit our website to learn more and to get started.